Roasted Shrimp with Tomatoes, Capers and Feta | Food E.
I have a small collection of cookbooks, and truth be told, they serve more as kitchen decoration than anything else. I decided it’s because cooking from a cookbook is a gamble: you really have to trust the cookbook editor and publisher in order to guarantee a great recipe. I made some mediocre apple muffins a couple weeks ago from a cookbook, and I guarantee that if I had searched for the exact recipe online I would’ve found one with tons of notes in the comments and helpful tips on how to make those muffins stellar. I do, however, have a cookbook that I know is incredible (I used to work for the publisher heeeeeey) and all about roasting: literally called All About Roasting. My hesitation in using it is that roasting, to me, seems super involved and time consuming. But I read through it slowly one blissful warm Saturday morning with a hot cup of coffee and found this incredible shrimp recipe. Turns out roasting doesn’t always mean 4 hours in the oven. In a large bowl, toss the shrimp with 2 Tbsp of olive oil, garlic, oregano, red pepper flakes, vodka, and a pinch of salt. Toss and coat and let marinade for 30 minutes at room temperature. Spread the tomatoes in a shallow baking dish (I used a 8″ x 10″ Pyrex dish), drizzle with remaining Tbsp of olive oil, and sprinkle with capers. Arrange the shrimp on top of the tomatoes and pour extra marinade over the top. Bake for 8 minutes, or until the shrimp are mostly pink. Using tongs, flip shrimp and cover with feta cheese. Bake for another 8 – 10 minutes or until shrimp are cooked through completely. Feta will be slightly melted. 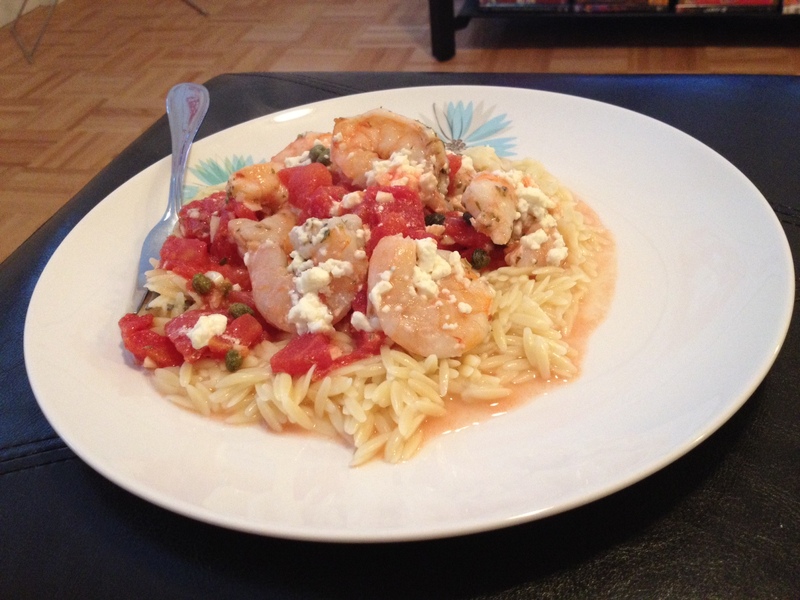 Note: I served this over buttered orzo and it made a lovely weeknight meal with minimal effort. #Win.